First Home Dreams: Oli, Oli, Olioboard! I first heard of Olioboard from the fantabulous Addicted2Decorating blog (seriously, follow her. She rocks!). I finally decided to check it out for myself today, and I love it! It's a ton of fun, and I'm quickly discovering that it's easy to kill a whack of time there (just like Pinterest). We're in the midst of building our shed right now, and once that's done we can start concentrating again on the bathroom. But let's be honest...I don't care much about designing the shed and haven't really stopped thinking about the bathroom. 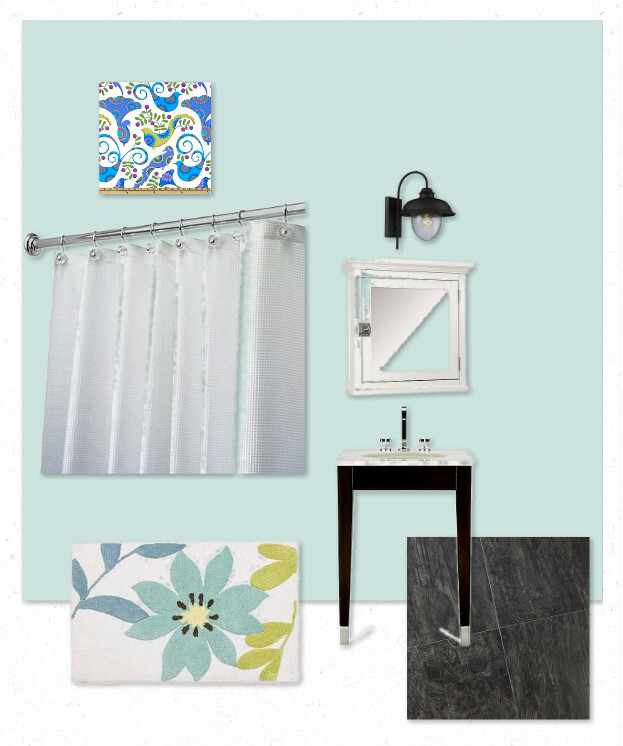 So, of course when I signed up to Olioboard the first thing I did was get started on my "Test" board using all things bathroom! It's pretty rough, but that's why it's a "Test". The thing that I really, REALLY love about this, is that it tells you where you can buy all of these items! While I love that feature, I probably won't purchase much from the mentioned establishments. We already have a white fabric, waffle patterned shower curtain, and we will be re-using our current sink with some modifications so that it will have a similar shape to the one above. The plan is for a dark grey tile floor, perhaps slightly lighter than above. We're going to see about DIY'ing a medicine cabinet in a similar style to the one pictured (with hardware in black/oil rubbed bronze). I ADORE that bath rug from Target and I might buy it because I never see anything I love in stores. My plan is to go with a single above cabinet sconce light from Barn Light Electric, again in a similar style to above. The fabric pictured was just put there for visual reference for me to better imagine my no-sew shades with this scheme. Now that I've found out that I can actually purchase that fabric online, I might just have to get some! It even tells you what colour paint you've selected and what brand makes it. I'm not 100% sold on this colour, but I know I want a pale blue-green. Thank goodness day-dreaming is free.